Hi everyone! 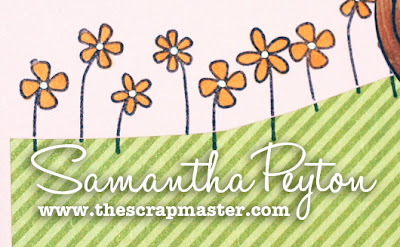 Samantha here & I just wanted to share some of my recent projects with you. I have been coloring up a storm lately. I hope that you enjoy the inspiration. 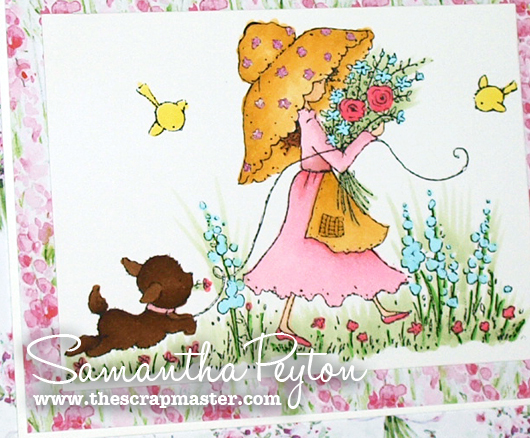 First, I made an Easter card using an image I had colored a while ago. This is from La-La Land Crafts, called Marci With Bunny. In a previous post, I showed how I colored her hair. You can watch my video by clicking here! 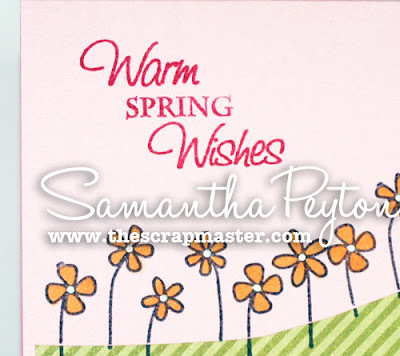 Next, I made a cute little spring scene with the Sitting Lovely stamp set from The Greeting Farm. 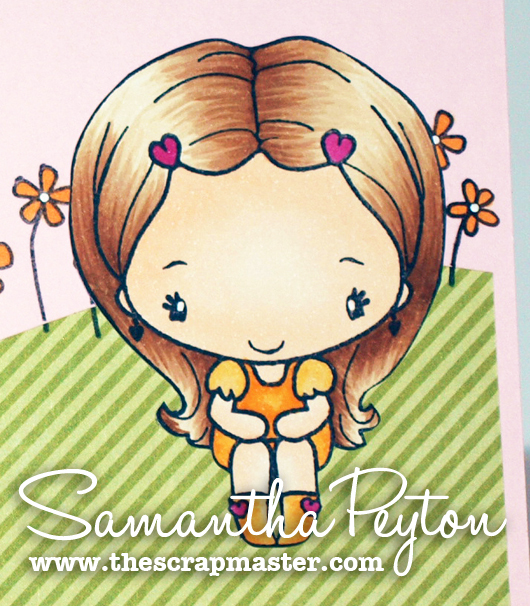 This set contained this adorable sitting Anya and the flower stamp I used for the flowery hillside. 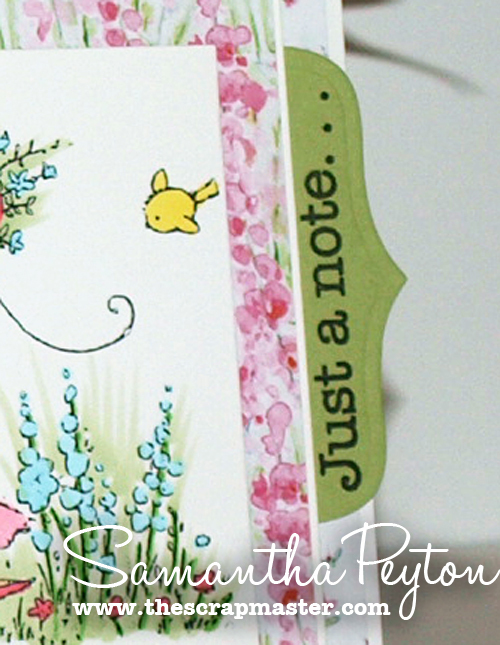 The sentiment was made using the Mix n Match Sentiments: Occasions stamp set from SP & Company. The three words are separate stamps in the set so you can arrange the words in this set any way you like. 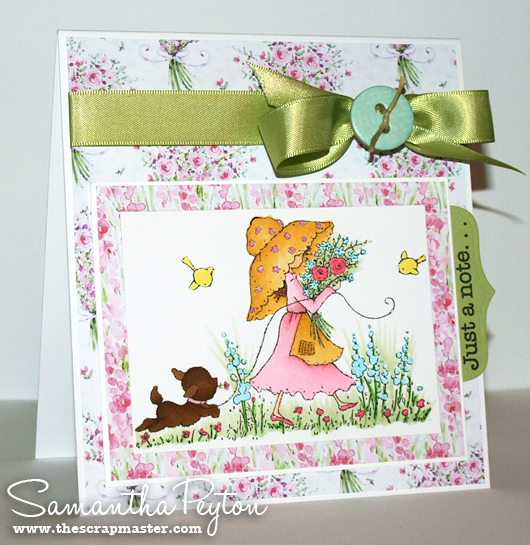 My next card features a new Wild Rose Studio stamp, called Annabelle in the Meadow. The patterned paper is from the coordinating Wild Rose Studio 6x6 paper pad called Annabelle's Meadow. I drew my color scheme from these patterned papers that I used on my project. I also added some ribbon & a cute button & twine from the Trendsetters Buttons & Twine set from Webster's Pages. The button is a cardboard adhesive backed button. 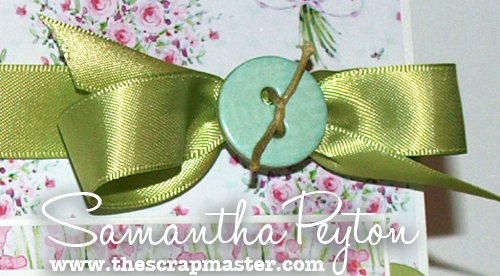 So easy to work with because it just stuck right to the ribbon. Have a great day! Marie will be back tomorrow with something amazing to share!! Beautiful cards. I love the colors you picked. I think the second card is my favorite. I really love the coloring and the simplicity of the card! All your cards are wonderful, but I really love the little scene you created in the second one! TFS! Beautiful cards. Your designer papers really coordinate so well with your Wild Rose image. And I love your coloring on all the cards. Well done. Chocolate? Did Someone Say Chocolate? iCopic Weekly Challenge #75 - Yellow Greens! Fixing Those Nasty Little Stamping Errors!